Why is this so important to survival? Because all living organisms need clean water to survive. Humans are no different, and it’s been true throughout human history. In fact, if you look for locations where human societies have grown, developed and prospered, you’ll notice they all have one thing in common: a permanent and abundant source of clean water. The search for abundant, clean, reliable, drinking water is THE driving need for human society. And once such a water source is found; tribes, towns, and cities are built. A large group of people living in a single location is not possible without a large natural body of water nearby. Phoenix, Arizona is built on the Salt River. Denver, Colorado is built in the shadow of the Rocky Mountain snow melts. Las Vegas was only possible thanks to the damming of the Colorado River to create Lake Mead. Egypt’s history is inextricably linked to the Nile; its annual cycle of flooding was used to irrigate crops and provide clean drinking water for its large population. Every long lasting, city or town, must procure and deliver clean water to its citizens. If the water is not abundant or it’s contaminated, people will leave. However, many people living in the same space creates an overwhelming clean water challenge: sanitation. Humans are dirty. We create lots of gross wastes. Wastes that can easily contaminate the very water we drink. And drinking polluted water is hazardous to your health. Even in ancient times, people understood the difference between good and bad water. Dirty water tasted bad; clean water tasted good, it was a straight-forward proposition. It was also common knowledge that dirty water was somehow related to illness. And this was way before the microscope was invented. People require clean water, always. And always will. But it wasn’t until the middle 19th century that the spread of diseases, cholera specifically, was scientifically linked to contaminated public water sources. The man who linked cholera to a public water source in London was named John Snow. Ok, I’ve made my point, drinking contaminated water is bad for human survival. So for our purposes, I’m going to jump into the present. With the advent of technologies we now take tap water for granted. When we turn on the tap, clean water will flow. This convenience is everywhere in our lives, used for everything from cooking and cleaning in our homes, to thousands of industrial uses. This convenience is everywhere. We use tap water for cooking, cleaning, washing, drinking and flushing in our homes. Also interesting, but hardly surprising, the EPA also estimates that 90 percent of the world’s water is contaminated in some way. My point here is that we use an awful lot of water in our daily lives and in a dire emergency situation, it’s likely you won’t have easy access to clean drinking water. If the power grid goes down for the long haul (due to a winter storm, an emp attack, etc. ), the water pumps won’t run and water won’t keep coming out of your taps. Water taps need water pressure to operate. Water pressure is the force that shoves the water through the pipes and out of your taps. However, water pressure rarely occurs naturally. In 99% of situations, your water pressure is created by a mechanical system. Mechanical pumps push the water into a large storage container located at an elevation higher than the homes it services. This large water storage container is often called a water tower. Once this water is pumped and stored at this higher elevation, gravity is allowed to do its job and create the necessary water pressure in our homes. The bottom line is this: It requires water pumps to make this magic happen. No electricity = no water pumps. Zero water pumps = zero water pressure. No water pressure, no water coming out your water taps. So if disaster strikes your hometown, the unprepared masses will be forced to venture to the nearest abundant water source and collect it in buckets or containers. That’s challenge #1. But let’s assume you are able to safely procure water in such a scenario. Are you confident this water source won’t make you severely sick? The answer is no you’re not certain, and that’s why you need water purification and why it’s key for your survival. Before going into the methods of water purification, it’s useful to understand the different types of unhealthy water. There is biological contamination, which means microorganisms, Giardia for example. This common little bug will cause intestinal disorders. Another type of polluted water is referred to as toxic. Which means chemical contamination. Toxic water can result from leaky gas or fuel tanks seeping into waterways, or entering the water table. It can also be caused by corroded lead water pipes (think Flint, Michigan). I’m not an alarmist, water is so necessary, so essential to our very lives, that we need to know how to safeguard our water supply. Equally important, we need to know how water purification works if local tap water sources become cut off or contaminated. There are numerous types of water purification systems available. I will list the most popular methods below and address some of the pros and cons of each. From the water pitcher, which you fill with tap water, and then let the water gravity flow through a replaceable filter cartridge; to the portable water filter, which can be carried in a bug-out bag or backpack, and uses a syringe mechanism to force water through an integral filter, both are useful in many situations. Depending on your circumstances, you’ll get to choose which is best for you and your family. However, at the bare minimum, the water purification system you select must be able to stop pathogenic organisms. Common bugs that are waiting to infect you in untreated water include (but are not limited to) E.coli, cholera, hepatitis, giardia, polio, plus all kinds of exotic protozoans and metazoans, which can infect your blood, brain, and internal organs. You don’t need to become obsessed with microbiology, you just need to understand unfiltered water is dangerous. Below is a list of the major filtration and water purification systems, as well as chemicals you can use to make your water safe to drink. Boiling water kills a lot of different bugs, but not all. The World Health Organization (WHO) recommends bringing water to a rolling boil, then letting it cool down naturally before consuming. This will kill the most common disease-causing pathogens, viruses, and bacteria. The biggest downside of relying on boiling for water purification is how time-consuming it is. First, you need a heat source. And in an emergency, forget about using a stove top. So you have to build a fire. Then you have to put water into a fire-safe pot and wait for it to reach a full rolling boil. Next, you have to let it cool before drinking it. So while boiling is effective, it’s not efficient for purifying lots of water. Boiling water also will not remove particulates (such as toxic metals), in order to remove those your best best is filtration. Here’s a short video on how to boil water in the wilderness with hot rocks. There are a lot of water filtration options, and most use a ceramic filter. Many are designed with hand pumps, easy to use, and small enough to carry with you wherever you’re headed. Or wherever you happen to be. Most of these filters trap microscopic particulates down to a size of 0.2- 0.3 micrometers, but they don’t trap tiny viruses, so chemical treatment is necessary if you want to be really safe! Activated charcoal absorbs many toxins, and also improves the taste of water, so it’s frequently used in conjunction with hand-held pump-type filters. Combination ceramic/carbon core filters are the best all-around type of filters to use. The biggest downside of using a water pitcher for filtration is the expense of buying and maintaining them. You have to purchase the pitcher, but you also have to periodically replace the filter; which is an ongoing expense. Plus if you’re preparing for a widespread emergency, you’ll need to stock up on replacement filters ahead of time. And the largest downside to portable filters in the past was their limited life. Similar to the replacement issue with the water pitchers, most these personal filters don’t have replacements filters and you just throw away the device once it’s used up. Halogens, mainly chlorine and iodine, are used to chemically disinfect water and are easy to use. Chlorine bleach is available almost everywhere and when used in conjunction with iodine, will kill most common pathogens found in natural water. Water purifying tablets use chemicals to kill biological contaminants in water, rendering it safe for drinking. They are usually effervescent and dissolve rapidly in water. They kill microorganisms by using different chemicals based on the tablet’s manufacturer. Some tablets use iodine or forms of chlorine such as NaDCC (Sodium Dichloroisocyanurate, which is sometimes called Triclosan Sodium) to kill organisms that may be present in the water. Water purification tablets are ideal for adding to a pack or carried in a bug-out bag. Ultimately you get to decide which chemical water purification method to use, but its hard to go wrong with good old Clorox. One concern with using chemicals to treat your water is messing up the ratios. Consuming overly treated water can be a health hazard; especially for kids and elderly. Also, chemical treatments can’t protect water from hazardous particulates such as lead. Lead is a metal and chemical treatment won’t remove it, filtration is your best bet for removing harmful particulates. UV light purifies water by inducing the formation of covalent linkages on DNA. This prevents microbes from reproducing. Well, actually it doesn’t kill microbes, it “turns off” their ability to reproduce. The UV treated water needs to either be consumed immediately or stored in light-resistant containers because normal storage exposure to light can re-activate the microbes. Steri Pen is the leading portable UV Light manufacturer. Again, this method will prevent you from getting sick from biological viruses but not particulates or chemicals; you’ll need filtration for that. Here’s a quick video of how a portable UV pen works. It’s often suggested you should have at least 3 methods of fire starting for wilderness survival. Well, I believe the same methodology should also be applied to water purification. You should plan and prepare for multiple ways to purify your water for a prolonged emergency situation. And if you stock up a heat source with firewood, (and you should) then you can always fall back on boiling in a pinch. You should also stockpile chemical treatments. You can either buy lots of water purification tablets online or buy bleach in bulk. I also really like the UV option to stash in my survival pack, bug out bag, and get home bag. Here’s the UV Steri Pen I pack in my bug out bag. And if you buy a Steri Pen (or carry any other electronics) you’ll also need to have a way to recharge the batteries. I recommend you check out the PowerBank Solar Charger. This solar charger is ideal to clip onto a pack and collect the suns rays for energy. The PowerBank Solar Charger is an excellent piece of survival gear that you can use in everyday life as well. Have a quick watch of the video below where I review the solar battery pack to see just how versatile this device actually is. With each of these water purification methods, you cannot “kill” particulate contaminations, you must filter those out. So in conjunction with boiling, chemical treatment, and UV light; you also need a water filtration plan. Having each of these options will help provide redundancy to most biological hazards and also remove harmful particulates as well. Besides filtering water, you should think about storing water, and identifying sources of clean water if you live in a rural area. If you’re in an urban area, you’ll be dependent on the local municipal water supply. That makes storing water a major priority. Another opportunity to collect was is building a rainwater collection system – if your local authorities allow it, it’s smart setup to put in place asap. If things get out of control in society, the supply of abundant clean water could just as suddenly evaporate, and that in turn could lead to all sorts of chaotic, dangerous situations. You don’t want to gamble by consuming filthy water. If the worst ever happens, it’ll be a real problem unless you prepared for it. Do these 5 action steps and you’ll have all your water purification bases covered for today, tomorrow and the future. P.s. 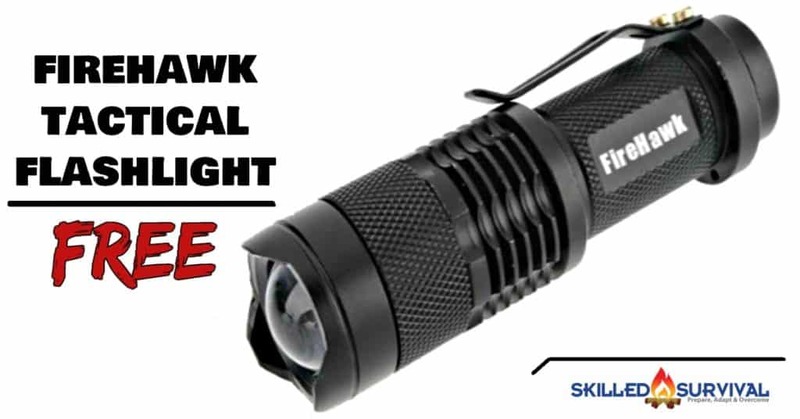 -For A Limited Time Only -Get a FREE FireHawk Tactical Flashlight For Visiting Skilled Survival! Just $3.49 s&h. Click Here To Learn More. There are some chemicals that cannot be removed from water by these traditional water purification methods (filtration, boiling, chemical, UV). For example, You’re not going to be able to filter or boil out Uranium from your water supply. I’m no expert on farm fertilizers but they may also fit into that same category. One of the limits to filtration is if the chemical or particulate is smaller than a molecule of water, there’s no way to filter that particulate out and let the water molecules pass through. A filter membrane designed to trap such a small molecule wouldn’t allow the water through either. The limits of boiling is that heat will only kill things that are alive such as bacteria. Chemicals are not alive, so heat won’t kill them. Same goes for UV treatment. Keep in mind that bleach has a limited lifespan. Unless you are constantly rotating your bleach, it may not be able to reliably treat your water.